Most of the unit's police officers have one horse for whom they are primarily responsible. This, of course, includes grooming. The delicate business of shoeing is contracted out to a qualified farrier. Constable Richard Cooper partners with Constable Harold Williamson in training the new mounts. Sergeant Jim Patterson trains officers new to the unit. Moose, right, was donated to the unit by former Maple Leafs GM Brian Burke. Patterson, Williamson, Moose, and Bobby prepare to hit the road. Each horse has its riding hours documented here. Somewhere in this pile of hay hides the mounted unit's resident "barn" cat. The stable's spacious shower stalls. Once a horse has completed its training, tradition dictates that its mane be cropped short. 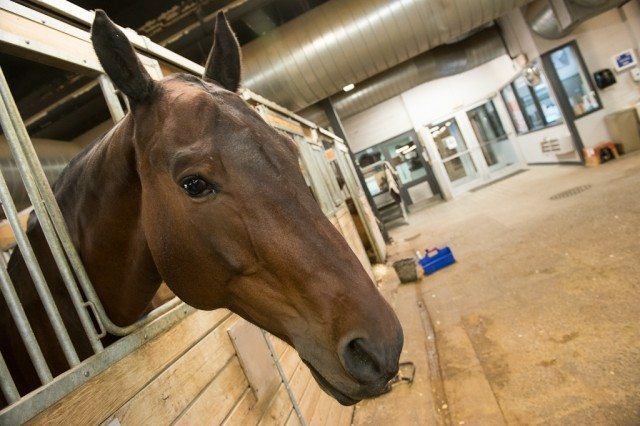 With just a hint of trepidation, Sergeant Jim Patterson urged his ride—a five-year-old smallish black gelding named Bobby—through the back door of the CNE Horse Palace and out onto Manitoba Drive. To Patterson’s left, Constable Harold Williamson sat atop Moose, whose dark mane was cropped short save for a frizzy forelock hanging down between his eyes. Despite the inexperience signified by this hairdo—it’s given to all horses who are still undergoing the months-long training process that precedes a job with the Toronto Police Service’s mounted unit—it would be up to Moose to set a good example, on this rainy November day, for a horse more green even than he. Bobby, from a farm in the vicinity of Wingham, Ontario, had been in the police stables less than two short weeks. Bobby was making a good impression. Provided a visit with the vet didn’t reveal any problems he’d have a job, and the police wouldn’t need to buy another horse until the spring. For Patterson and Williamson—the ones in charge of choosing and buying the unit’s mounts—this would be something of a relief; unfortunately for them, they have no magic formula when it comes to finding horses well-suited to police work. With 25 horses belonging to the unit, and with each capable of working a good 20 years, Patterson and Williamson are only periodically in the market for a new recruit. 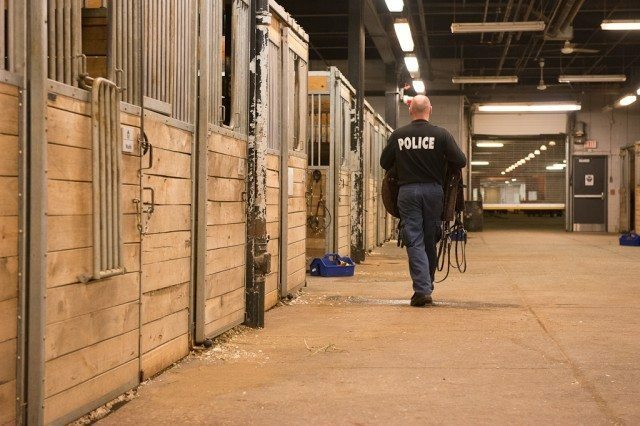 Unlike the RCMP, which runs its own breeding farm in the Ottawa Valley, Toronto’s mounted police rely on a small handful of local farmers and breeders to be always on the lookout for a good horse at a reasonable price. His replacement did not prove easy to find. “All our usual places just had nothing in the stream that was usable for us,” says Patterson. “So for this one we just sort of cast our net a little wider.” Eventually, they got wind of a family near Shelburne, Ontario that was looking to sell a bay-coloured Clydesdale-thoroughbred cross named Tetris. At seven, he’s a little older than the horses Williamson and Patterson tend to buy, but he did well during his two-week trial, passed his vet check, and was welcomed into the fold. Now he faces at least an additional six months of training, a name change to something befitting his personality, and assignment to one of the unit’s constables.